Gifts Sets: Earth Mama, Earth Henna, Burt's Bees, J.R. Watkins, MOOM! • Shea Baby Gift Set: Shea Moisture Shea Baby is made with certified organic Shea Butter to deeply moisturize and repair skin, Chamomile relieves red, irritated skin and Argan Oil keeps skin soft and smooth. Helps soothe, hydrate and calm dry, itchy, irritated skin. Gentle enough for everyday use and keeps baby comfortable all day long. 4 pc. ORDER TODAY! Shea Baby Gift Set, 4 pc. SETS & KITS: Shea Baby Gift Set, 4 pc. • A Little Something For Baby Kit: Here's a perfect little gift for a perfect little baby! Loveable on-the-go sized editions of Earth Mama's pure, natural bubblers, soothers, and smoothers. Zero toxin goodness, A Little Something For Baby is an all-natural welcome for a brand new gift from heaven. A perfect way to sample! 4 pc. ORDER TODAY! --1 Angel Baby Shampoo & Body Wash: Safe, detergent-free all-natural and organic castile shampoo-soap for foamy fun baby bath time, hand washing and head-to-toe family clean. 1.67 oz. --1 Angel Baby Bottom Balm: Earth Mama's #1 best-selling salve safely battles existing diaper rash and protects against flare ups. Helps soothe thrush, itchy bug bites, scrapes, chicken pox, minor rashes, and burns. 1oz. --1 Angel Baby Lotion: Helps moisturize and protect sensitive, delicate skin, for babies of all ages - top to bottom, cheeks to cheeks. Helps soothe eczema, skin allergies and diaper rash, and smells so naturally good. 2oz. --1 Angel Baby Oil: Perfect for sensitive little noses, ideal for massage or dry skin! 1 oz. • A Little Something For Mama-To-Be Kit: A Little Something for The Mama-To-Be is a pocket full of pampering for those common little extras that go along with pregnancy! Zero toxin essentials, safe for pregnancy, packed in a cute purse pack - A Little Something for The Mama-To-Be is a little gift that indulges a special mama in a big way, naturally! A perfect way to sample! 5 pc. ORDER TODAY! -- 1 Happy Mama Hand to Toe Wash: Uplifting and help ease the nausea, formulated especially for pregnancy and ideal for noses that are sensitive from morning sickness. 1.67 oz. -- 1 Happy Mama Spray: A gloriously uplifting aromatherapy spray for pregnancy nausea, on-edge new mamas. For a quick spritz of bliss to get a queasy mama (or car sick kid) through the moment. 1 oz. -- 1 Earth Mama Body Butter: The most luxurious lotion for dry, itchy, stretching skin and pregnancy stretch marks. 2 oz. -- 1 Natural Stretch Oil: Helps deter stretch marks and relieve the itch, and the light, delicate scent won't aggravate morning sickness. 1oz. -- 1 Organic Morning Wellness Tea (2 bags): For the pregnant mama who has everything: nausea, heartburn, anxiety and labor on the horizon any time of day. Steep, sip and enjoy! A Little Something For Baby Kit, 4 pc. A Little Something For Mama-To-Be Kit, 5 pc. For Baby, 4 pc. | For Mama-To-Be, 5 pc. 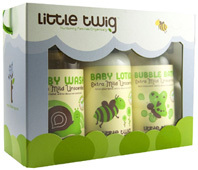 • Gentle Care Gift Set: Gentle Care Gift Set was exclusively created for little ones with extra sensitive skin. Ultra mild formulas use only the gentlest ingredients to keep baby silky smooth tub after buddy tub. 4 pc. ORDER TODAY! -- 1 Extra Mild Unscented Bubble Bath: Unscented, super-mild balance of Aloe, Vitamin E and Jojoba is ideal for little ones with extra sensitive skin. 8.5 oz. -- 1 Extra Mild Unscented Baby Wash: For silky skin and downy soft hair. Our vitamin-enriched blend is ideal for newborns. 8.5 oz. -- 1 Extra Mild Unscented Body Milk: Unscented, all-over moisturizer is made for little ones with extra sensitive skin. Gentle botanicals and calming Aloe offers baby with gentle, long lasting protection! 8.5 oz. -- 1 Soft Washcloth: Provides skin a fresh glow by softly washing away dead skin cells and surface impurities. • Baby Basics Gift Set: The perfect gift for baby showers, the Baby Basics Gift Set will help get your favorite new family off to a great start with our fun, all natural bathing essentials. 4 pc. ORDER TODAY! -- 1 Extra Mild Unscented Baby Powder: Gentle, talc-free formula helps absorb moisture and soothe the skin. -- 1 Calming Lavender Baby Wash: Shower your little one in calmness with this organic blend of essential oils and mild foam. -- 1 Calming Lavender Baby Lotion: Nurtures dry and troubled skin with gentle, milky moisture. -- 1 Soft Washcloth: Provides skin a fresh glow by softly washing away dead skin cells and surface impurities.ORDER TODAY! • Washcloth Triple Pack: Three colored Super Soft and absorbent washcloths presenting Buddy, Blu, & Scoot, provides your skin a renewed glow by gently washing away dead skin cells and surface impurities.3/pack. ORDER TODAY! Gentle Care Gift Set, 4 pc. Baby Basics Gift Set, 4 pc. SETS & KITS: Gift Set, 4 pc. 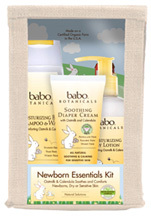 • Newborn Essentials Gift Set: Babo Botanicals Newborn Gift Set is packed with the essentials that you will require to maintain your baby's skin clean and hydrated. Includes a Soothing Diaper Cream, Moisturizing Shampoo & Wash and Moisturizing Lotion blended with Oatmilk and Calendula. Dermotologist tested for sensitive skin, so you know they are safe and gentle for young, delicate skin. Assembled in a natural, reusable jute bag. 3 pc. ORDER TODAY! -- Moisturizing Baby Shampoo & Wash, 8 oz. -- Moisturizing Baby Lotion, 8 oz. -- Soothing Diaper Cream, 3 oz. Ingredients: Organic Aloe Barbadensis Leaf, Purified Water (Agua), Sodium Laurylglucosides Hydroxypropyl Sulfonate (Sugar Soap), Sodium Methyl Cocoyl Taurate (Coconut), Disodium Cocoamphodiacetate (Coconut), Glycerine (Vegetable), Polyquaternium 80 (Sugar), Hydrolyzed Oat Protein, Organic Calendula Officinalis Extract, Linum Usitatissimum (Linseed) Seed Extract, Glucono Delta Lactone (Sugar), Organic Anthemis Nobilis (chamomile) Flower Extract, Organic Nasturtium Officinale (Watercress) Extract, Organic Pueraria Lobata (Kudzu) Root Extract, Polyquaternium 10 (Vegetable Fiber), Potassium Sorbate (Food Grade Preservative), Natural Essential Oil Blend of Vanilla & Cedarwood. Newborn Essentials Gift Set 3 pc. SETS & KITS: Newborn Essentials Kit, 3 pc. • Baby Bee Getting Started Kit: From cleaning to moisturizing, with Baby Bee Getting Started Kit a new mama is ready for anything. Affectionately packed with a full collection of nature's remedies right at her fingertips, it makes the perfect gift for mama and baby's beautiful delicate skin. Pediatrician-tested and hypo-allergenic. Contents of kits are subject to change. 5 pc. ORDER TODAY! -- 1 Baby Bee Buttermilk Soap 0.8 oz. -- 1 Baby Bee Diaper Ointment 0.75 oz. -- 1 Baby Bee Nourishing Baby Oil 1 oz. -- 1 Baby Bee Nourishing Lotion 1 oz. -- 1 Baby Bee Shampoo & Wash 1.8 oz. • Hand Repair Kit: Your hands are always applying cleansers and creams to other parts of your body. With Lemon Butter Cuticle Cream to nurture, Almond Milk Beeswax Hand Creme and Shea Butter Hand Repair Cream to hydrate, this kit has everything you need for naturally beautiful hands. Contents of kits are subject to change. Comes in a convenient reusable bag. 4 pc. ORDER TODAY! -- 1 Shea Butter Hand Repair Creme, 0.49 oz. -- 1 Almond Milk Beeswax Hand Creme, 0.25 oz. -- 1 Lemon Butter Cuticle Creme, 0.30 oz. 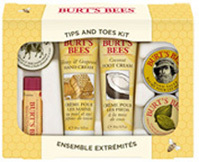 • Tips and Toes Kit: Tips and Toes Kit is a remarkable collection of rich creams and softening butters. Genuinely softening and happily moisturizing. Your fingers and toes will thank you. Contents of kits are subject to change. 6 pc. ORDER TODAY! -- 1 Almond Milk Beeswax Hand Cream 0.25 oz. -- 1 Coconut Foot Creme 0.75 oz. -- 1 Hand Salve 0.3 oz. -- 1 Thoroughly Therapeutic Honey & Grapeseed Hand Creme 0.75 oz. -- 1 Lemon Butter Cuticle Creme 0.3 oz. • Natural Acne Solutions 3 Step Regimen Kit: Natural Acne Solutions 3 Step Regimen Kit helps cleanse, moisturize, and target. The first truly natural acne solution clinically proven to decrease and prevent acne. Three natural acne remedies help keep your skin clear: Face Wash for oily skin, Daily Moisturizer for acne and the Acne Spot treatment. It's the natural solution to acne. Dermatologist tested and noncomedogenic. STEP 1 Cleanse: Daily Moisturizing Lotion 2 oz. STEP 2 Moisturize: Purifying Gel Cleanser 5 oz. STEP 3 Target Blemishes: Targeted Spot Treatment 0.26 oz. 6 pc. ORDER TODAY! Baby Bee Getting Started Kit 5 pc. Hand Repair Kit 4 pc. Tips and Toes Kit 6 pc. Natural Acne Solutions 3 Step Regimen Kit 3 pc. 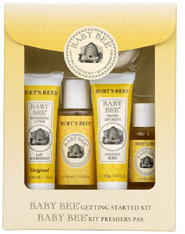 SETS & KITS: Baby Bee Getting Started Kit, 5 pc. Hand Repair Kit, 4 pc. | Tips and Toes Kit, 6 pc. SETS & KITS: Natural Acne Solutions 3 Step Regimen Kit , 3 pc. • Head to Toe Kit: Indulge yourself from head to toe with J.R. Watkins Natural Creams, Lotions and Lip Balms. This collection of nurturing essentials offers daily moisture for all skin types. Perfect for sampling traveling, or gift-giving! 5 pc. ORDER TODAY! -- 1 Pepperment Foot Cream, 1 oz. -- 1 Aloe & Green Tea Hand & Body Lotion 1 oz. -- 1 Lemon Hand Cream 0.70 oz. -- 1 Lavender Chamomile Body Butter 0.70 oz. -- 1 Natural Beeswax Lip Balm 0.15 oz. • A Few Of Our Favorite Things Kit: Enjoy a collection of our best-selling apothecary items. This is the perfect kit for sampling, traveling, or gift-giving! 5 pc. ORDER TODAY! -- 1 Lavender Body Oil 1 oz. -- 1 Coconut Milk & Honey Hand & Body Lotion 1 oz. -- 1 Weatherproofing Lip Balm 0.15 oz. -- 1 Foot Repair Salve 0.25 oz. -- 1 Lemon Cream Hand Cream 0.7 oz. • Hands and Feet Retreat Kit: Invigorate hardworking hands and tired soles with the Hands & Feet Retreat Kit. This wonderful set contains everything you need to keep your hands and feet groomed to perfection. 4 pc. ORDER TODAY! -- 1 Foot Repair Salve 2.1 oz. -- 1 Lavender Hand Cream 3.3 oz. -- 1 Buffer Pad ORDER TODAY! 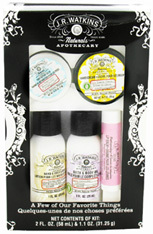 • Lavender Essentials Kit: From time to time you just need to unwind and rejuvenate. Relax with the scent of lavender known for its soothing properties. Perfect size to carry in a gym bag, purse or backpack. A perfect way to sample. 8 pc. ORDER TODAY! -- 2 Lavender Hand & Body Lotion 1 oz. -- 2 Lavender Hand Cream 0.7 oz. -- 2 Lavender Hand & Cuticle Salves 0.25 oz. -- 1 Calming Lavender Bath Soak 1 oz. -- 1 Raspberry Weatherproofing Lip Balm 0.15 oz. Head to Toe Kit 5 pc. A Few Of Our Favorite Things Kit 5 pc. Hands and Feet Retreat Kit 4 pc. Lavender Essentials Kit 8 pc. SETS & KITS: Head to Toe Kit, 5 pc. Hands and Feet Retreat Kit, 3 pc. | Lavender Essentials Kit, 8 pc. SETS & KITS: A Few Of Our Favorite Things Kit, 5 pc. 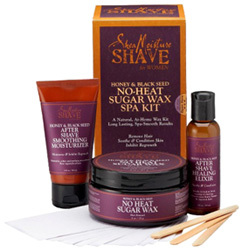 • Women Honey & Blackseed Shave Kit: Shea Moisture Women Honey & Blackseed Shave Kit offers an effective, comfortable waxing experience, naturally targeting ingrown hairs, uneven skin tone and reducing regrowth. No-Heat Sugar Wax is made with Raw Sugar, organic Shea Butter, skin perfecting Black Seed Oil, moisturizing Honey, essential oils and botanical extracts. Helps remove unwanted hair from anywhere on the body, including sensitive areas such as face and bikini line. Exfoliates and removing hair, leaving skin soft, smooth and clean. Provides a natural alternative to hot waxes that may contain chemicals and preservatives, which can cause allergic reactions. Washes off instantly with soap and water. After Shave Healing Elixir helps calm, relieve irritation and reduce redness caused by any hair removal, and prevent ingrown hairs. After Shave Smoothing Moisturizer helps condition skin and prevent future hair growth. -- 1 No-Heat Sugar Wax, 6 oz. -- 1 After-Shave Healing Elixir, 2 oz. -- 1 After-Shave Smoothing Moisturizer, 2 oz. NO HEAT SUGAR WAX: Sugar (Raw, Brown) Deionized Water, Honey Butyrospermum Parkii (Shea Butter(Vinegar, Alpha Bisabolol, Black Seed Oil, Willow Bark Extract, Lemon Juice, Citric Acid, Vitamin E, (Proprietary) Essential Oil Blend, Japanese Honeysuckle Extract. AFTER SHAVE HEALING ELIXIR: Deionized Water, Witch Hazel, Denatured Alcohol, Butyrospermum Parkii (Shea Butter), Willow Bark Extract, Vegetable Emulsifying Wax, Aloe Barbadensis Leaf Juice, Cascarilla Bark Extract, Simmondsia Chinensis (Jojoba) Oil, Vitamin A, Alpha Bisabolol, Panthenol (Vitamin B), Vitamin E, Tea Tree Oil, Honey, Black Seed Oil, Peppermint Extract, (Proprietary) Essential Oil Blend, Japanese Honeysuckle Extract. AFTER SHAVE SMOOTHING MOISTURIZER: Deionized Water, Butyrospermum Parkii (Shea Butter), Mangifera Indica (Mango) Oil, Theobroma Cacao (Cocoa) Seed Butter, Coconut Oil, Vegetable Emulsifying Wax, Aloe Barbadensis Leaf Juice, Gymnema Sylvestre Leaves Extract, Cascarilla Bark Extract, Simmondsia Chinensis (Jojoba) Oil, Vitamin A, Alpha Bisabolol, Panthenol (Vitamin B), Honey, Punica Granatum (Pomegranate) Seed Oil, Black Seed Oil, (Proprietary) Essential Oil Blend, Japanese Honeysuckle Extract. .
Women Honey & Blackseed Shave Kit, 3 pc. SETS & KITS: Women Honey & Blackseed Shave Kit, 3 pc. • Introductory Kit: MOOM is chosen by women around the world, who are enthusiastic about natural, herbal skin care. This revolutionary product offers benefits of long term depilation, diminishes the pain and elimates the discomfort of waxing and other methods. 27 pc. ORDER TODAY! Organic Hair Removal Kit (Spa Formula): MOOM'S exclusive technology uses only the purest certified Organic and natural ingredients to deliver an effective and nourishing hair remover. This unique product stands alone as the gentlest, the most effective and the most pleasant long term hair remover. Helps remove the hair gently with the root and leaves skin hair-free for up to 8 weeks. Revitalizes the skin by removing impurities and dead cells from the surface of the skin. Sturdy enough for the most stubborn hair, yet gentle enough for the most sensitive area. Can be applied on legs, face, bikini, underarms and whole body. Leaves no residue on the skin. Ideal for dry skin. Hypoallergenic..
• Lavender (For Extra Sensitive Skin): MOOM Organic Hair Remover with Lavender pampers your skin with calming Chamomile, delicious Lemon juice and soothing Lavender. 27 pc. ORDER TODAY! • Rose Essence: MOOM Organic Hair Remover with Rose pampers your skin with soothing Chamomile, delicious Lemon juice and luxurious Rose Essence. 27 pc. ORDER TODAY! Introductory Hair Removal Kit, 27 pc. SETS & KITS: Introductory Hair Removal Kit, 27 pc. SETS & KITS: Organic Hair Removal Kit, 27 pc. Enriched with essential oils and effective skin-enhancers for a simple ALL-in-ONE Hair Removal System. Exclusive Spa Formula. 100% Natural & Botanical. Ideal For Sensitive Skin. Microwavable Formula Safe, Gentle, Effective and Easy to Use. • For Men Hair Removal System Kit: Until now, all hair removers have concentrated on removing unwanted hair and have not cared about what damage they cause to the skin underneath. MOOM® has revolutionized the hair removal industry by making the skin the first consideration. 23 pc. ORDER TODAY! -- MOOM® for MEN sugaring blend, 6 oz. • Fabric Strips Kit 48 pc. : Moom Fabric Strips are the result of testing hundreds of different fabric weaves and fabric contents from around the world to find the perfect product. 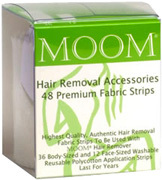 Moom strips are made from authentic unbleached cotton with a poly mix and just the correct weave to ensure the fabric will remove the most hair with the least amount of discomfort. Moom Fabric Strips will not fray, shrink or wrinkle and have been specifically designed to be reused over and over again. You simply rinse the fabric strips after each use with warm water or add them in to your regular machine wash. They can be air-dried or put into a clothes dryer, and will last for years. ORDER TODAY! Fabric Strips Kit 48 pc. SETS & KITS: For Men Hair Removal System Kit, 23 pc. SETS & KITS: Fabric Strips Kit, 48 pc. • Love Oils Rollerball Gift Set: Get ready for all of your lover's moods with a travel size of all of the best-selling love oils which includes Origins, Indian Spice and Caribbean Rose. Natural aphrodisiac aromatherapy at your fingertips! Used individually each oil develops its own character and arouses a distinct love response. Good Clean Love Oils make touching, kissing and smelling each other better. The oil formulas leave your skin feeling as good as it smells. They are exceptionally nurturing to the skin, with the ability to soften, smooth and heal the skin. All Good Clean Love oils are made with apricot kernel oil, organic jojoba oil, Tocopherol, and an exotic blend of essential oils. They are safe to use anywhere on the body. 100% vegan, edible. Contains: 1 of Each Trial Size Oils --- Caribbean Rose, Indian Spice and Origins. 3 pc. ORDER TODAY! Ingredients: Apricot Kernel oil, organic jojoba oil, Vitamin E antioxidant formula, exoticblend of essential oils. Love Oils Rollerball Gift Set, 3 pc. 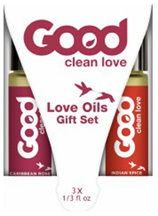 SETS & KITS: Love Oils Rollerball Gift Set , 3 pc. • Original Body Painting Kit: Original Earth Henna Body Painting Kit is a user-friendly kit for creating beautiful temporary tattoos on your own body or for your friends. Earth Henna paste needs only six hours on the skin for a deep, dark, rich color that lasts 1-3 weeks! Includes clear step-by-step instructions on how to mix the solution and apply your Mehndi designs, invaluable tips, and techniques from professional Mehndi artists. Cotton bag for storage of unused supplies. Makes 30–40 designs. ORDER NOW! -- Natural Henna Powder of Morocco, 1/3 oz. -- Henna Mixing Solution (to make henna paste), 19 ml. -- Eucalyptus Oil (to apply stencil designs), 5 ml. Ingredients: Henna Powder, Water, Benzyl Alcohol, Citric Acid, Disodium EDTA, Lactic Acid. • Original Body Painting Kit Refill: ORDER TODAY! • Body Painting Kit and Mehndi Book Set: Earth Henna Body Painting Kit is a user-friendly kit for creating beautiful temporary tattoos on your own body or for your friends. Earth Henna paste needs only six hours on the skin for a deep, dark, rich color that lasts 1-3 weeks! Includes the book Mehndi: The Art of Henna Body Painting, by Carine Fabius, contains over 140 illustrations and photographs; history of the art form; step-by-step instructions for creating your own beautiful tattoo designs; and practical techniques from professional mehndi artists. Comes with clear step-by-step instructions on how to mix the solution and apply your Mehndi designs, invaluable tips, and techniques from professional Mehndi artists. Cotton bag for storage of unused supplies. Makes 15–20 designs. ORDER TODAY! -- Natural Henna Powder of Morocco, 5 grams. -- Henna Mixing Solution (to make henna paste), 5 grams. • Kids Body Painting Kit: Kids' Henna Tattoo Kit is fun to use and contains enough henna powder and mixing solution for boys and girls to get started on creating their own beautiful temporary tattoos and henna designs. 13 re-usable stencil transfers included designs a snap! Enough henna for 15 or more designs. Pre-measured for perfect consistency every time. Once mixed, henna paste can be refrigerated for four weeks. For kids age 9 years old and up. Makes 15–20 designs. ORDER NOW! ORDER TODAY! -- Henna Mixing Solution (to make henna paste), 11 grams. -- 1 Knotty Boy Dread Wax/Light Wax, 4 oz. -- 1 Dreadlock Shampoo Bar, 4.75 oz. -- 1 Bee Washed Pre-Dreading & De-Waxing Soap Bar, 1 oz. -- 1 Knotty Boy Dread Wax/Dark Wax, 4 oz. 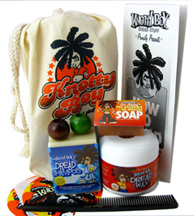 SETS & KITS: Dreadlock Starter Kit, 4 pc. 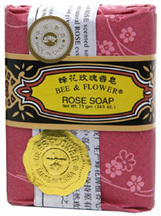 Bee & Flower Soap Gift Box: Attractively packaged and priced. Hand-milled for long soap life. Contains no artificial fragrances. Gives you delightful and lasting fragrance. Great gift idea. ORDER TODAY! • Sandalwood: 12/box, 2.65 oz. each. 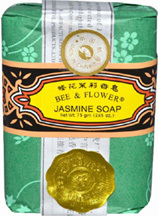 • Jasmine: 12/box, 2.65 oz. each. • Rose: 12/box, 2.65 oz. each. • Ginseng: 12/box, 2.65 oz. each. Sandalwwod Bar Soap Giftbox 12 pc.aJasmine Bar Soap Giftbox 12 pc. Rose Bar Soap Giftbox 12 pc.aaaGinseng Bar Soap Giftbox 12 pc. SETS & KITS: Bee & Flower Soap Gift Box: 12/box, 2.65 oz. each. • Sandalwood: 4/box, 4.4 oz. each. • Rose: 4/box, 4.4 oz. each. SETS & KITS: Bee & Flower Soap Gift Box: 4/Box, 4.4 oz. ea. • Superior Ginseng Soap: This fragrant and long-lasting soap is made with Korean Ginseng roots. Refreshing, cleansing and leaving your skin soft, smooth and healthy. Excellent gift idea! 3/pack. 4.06 oz. each bar. Net 12.18 oz. ORDER TODAY! SETS & KITS: Superior Ginseng Soap, 3/Pack, 4.06 oz.